Obama File 107 Neil Abercrombie, Yet Another Covert Socialist in the Obama "Orbit"
Neil Abercrombie was a long time Hawaii Democratic Congressman and is currently running for the Governorship of that state. While in Congress, Neil Abercrombie was one of Barack Obama's earliest and most vocal supporters. This is not surprising, as there is a close Obama/Abercrombie family connection and seemingy many shared values. While studied at the University of Hawaii at Mānoa in the early 1960s, Abercrombie attended classes with and befriended current United States President Barack Obama's parents, Stanley Ann Dunham and the young Marxist economist Barak Obama. 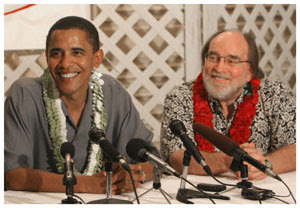 Sr.
Neil Abercrombie claims to have been Barak Obama's "best" friend. He also claims to have known young Barack Obama as a child and to know the values the future president of the United States was raised with. There maybe however another reason why Neil Abercrombie has been such a committed and zealous Obama supporter. I have written previously of Barack Obama's close ties to the the U.S.'s largest Marxist based organization, Democratic Socialists of America (D.S.A.). 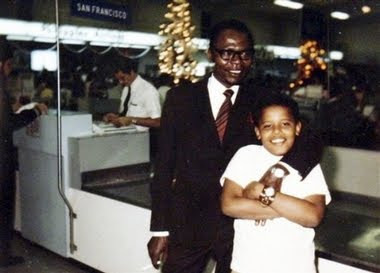 Obama attended socialist conferences in New York in the early 1980s at the Cooper Union, the usual venue for for the annual D.S.A. organized Socialist Scholars Conferences. Barack Obama worked with D.S.A. member Lou Pardo on voter registration in Chicago in 1992. From 1993 to 1996, he was a member of the D.S.A. influenced Progressive Chicago and its sister organization, the Chicago New Party. Obama dressed a D.S.A. forum and the University of Chicago in February 1996 and earned a D.S.A. endorsement for his Illinois State Senate run the same year. Obama's personal friends and mentors include D.S.A. members Quentin Young, Timuel Black, Congressman Danny K. Davis, Cornel West and the late Rabbi Arnold Jacob Wolf. Obama has appointed several D.S.A. connected individuals to positions of authority including Transition Team member and former Democrat Party whip David Bonior, Labor Secretary Hilda Solis and Senior Advisor to the Under Secretary of Defense and daughter of D.S.A. leader Barbara Ehrenrich, Rosa Brooks. Now it turns out that Neil Abercrombie also has D.S.A. ties. He has almost certainly been a covert member of that organization. According to D.S.A. 's magazine Democratic Left, Nov./Dec. 1990, page 4, in 1990 the D.S.A. 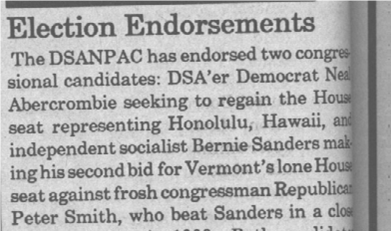 Political Action Committee endorsed two Congressional candidates, "DSAer Democrat Neil Abercrombie seeking to regain the House seat representing Honolulu and Vermont independent candidate Bernie Sanders...."
Does the phrase "DSAer Democrat" imply that Abercrombie was a member of that organization? Or was he simply a close associate and supporter like Bernie Sanders - also coincidentally a strong Obama supporter. According to Democratic Left, Winter 2007, Neil Abercrombie and D.S.A. and Communist Party USA connected Congressman Dennis Kucinich spoke at a Democratic Socialists of America Political Action Committee event in Washington DC at the home of leftist "philanthropist" Stewart Mott. The event was in support of Bernie Sanders. He (Sanders)flew to Washington and the next day attended the Washington, D.C., DSA PAC party at the home of Stewart Mott. Not only did Bernie Sanders speak; so did members of Congress Neil Abercrombie (HI) and Dennis Kucinich (OH). Christine Riddiough, former DSA National Director, served as host/ moderator'. Neil Abercrombie was also a member of the radical Congressional Progressive Caucus, which was founded by bernie sanders, with the help of D.S.A. George (Skip) Roberts, who has long served as a D.S.A. rep to the Socialist International has also worked as an aide to Congressman Abercrombie. In recent years Roberts has been active in the Republican Party representing his boss, then SEIU president, Andy Stern. More conclusive proof of Abercrombie's ties to D.S.A. , is the fact that his wife Nancie Caraway, an academic, noted for her far left views, has also been a D.S.A. member. In 1985, Dr. Nancie Caraway of Hawaii was listed as a member of the Feminist Commission of the Democratic Socialists of America. Note the presence of Barabara Ehrenreich on this list. in 2008, Ehrenreich founded Progressives for Obama , with D.S.A. comrades Bill Fletcher, Jr. and Tim Carpenter. Nancie Caraway is also a big Obama supporter. At Hawaii's Democratic Party headquarters, on Hawaii primary election night, February 2008, Caraway said that there were upwards of 5,000 people in her polling station...she described the turnout as inspirational. "I'm a postmodernist cynic," she said. "This is a new page in American political culture." At the "request of the Obama Administration", Dr. Caraway currently serves as a consultant to U.S. Ambassador Luis C. de Baca in the Office to Monitor and Combat Trafficking in Persons. To my knowledge Neil Abercrombie as never declared his affiliation with the D.S.A. Marxists to the voters of Hawaii. Perhaps he was concerned they might unnecessarily worry as to where his true allegiances lay? While an ardent opponent of almost every U.S. War from Vietnam to Iraq, Abercrombie finished his Congressional term as chairman of the Armed Forces Subcommittee on Air and Land Forces. It would be interesting to know if Abercrombie ever declared his socialist affiliations to government security bodies before accepting this sensitive post. It is worth noting that D.S.A. affiliated senator Bernie Sanders, addressed, a conference of the Communist Party USA controlled and Soviet affiliated U.S. Peace Council in November 1989, with then D.S.A. leader Manning Marable and D.S.A. affiliate Holly Sklar. It is also worth noting that 1990s D.S.A. National Political Committee member and Obama admirer, Kurt Stand is currently serving a very long jail sentence for spying for the former Soviet Union and East Germany. As an aspiring Governor of Hawaii, President Obama's old family friend and supporter, Neil Abercrombie, needs to answer some serious questions. P.S. Please follow the blue links in the post above, for comprehensive KeyWiki profiles of those featured individuals and organizations. Trevor, you say: "George (Skip) Roberts, who has long served as a D.S.A. rep to the Socialist International has also worked as an aide to Congressman Abercrombie. In recent years Roberts has been active in the Republican Party representing his boss, then SEIU president, Andy Stern.". This implies that the GOP is an ally of his, which I don't think you intended. Yes, there are Republican members of the S.E.I.U.,, but that's because they are forced to join the SEIU, not because they share their radical/Socialist agenda. It is past time to require that any and all who work for the American government submit to top secret security clearances. The enemy is embedded and they need to be rooted out.. There is NO way this fringe that weaseled its way into the Whitehouse by LYING represents the American people. It is time to throw them all in JAIL for treason and sedition. In my opinion Roberts is no genuine Republican. I believe is a socialist agent inside the Party. I'd like to know more about Robert's activities "in" the Republican Party. Is he a registered Republican (while working as a congressional aide for Dems)?! Does he operate as an official spokesperson for the GOP on some level? How did he gain access to the 2008 conference? Could anyone get in? Being an advocate for the SEIU, working to sell your Marxist agenda to Republicans is not the same thing as being "in" the Party. It talks about Roberts' "fellow Republicans" and gives Roberts' less than complimentary view of the RNC. Probably be easier to list who isn't a radical, marxist lefty moonbat in this administration. Kenya My Country, Tussker My Beer ! In the late '90's ( '98/'99 ) someone, somewhere, posted the link to dsausa.org, pointing out that there was a list on the dsa website of the 58 House members of the Democrat Progressive Caucus who were also members of the DSA. Listed among them were Bernie Sanders (of course), Maxine Waters, and none other than Neil Abercrombie. Not long after this information began racing around the internet, that list was taken down from the DSA site. Thanks for the work you put into this site. I read you daily, and often cite you on my blog www.guiltygovernment.wordpress.com Please stop by sometime. "The Responsibilities of American Citizenship"
"I"d Focus on the Police"